This is the second time I’ve made these. The first dozen, a few months ago, came out so well and so prettily that I couldn’t wait to make them again. But since we have the problem of hardboiled fresh eggs being terrible to peel, I had to wait until our next dozen eggs had aged a few weeks first (and even then, these were somewhat challenging to peel). 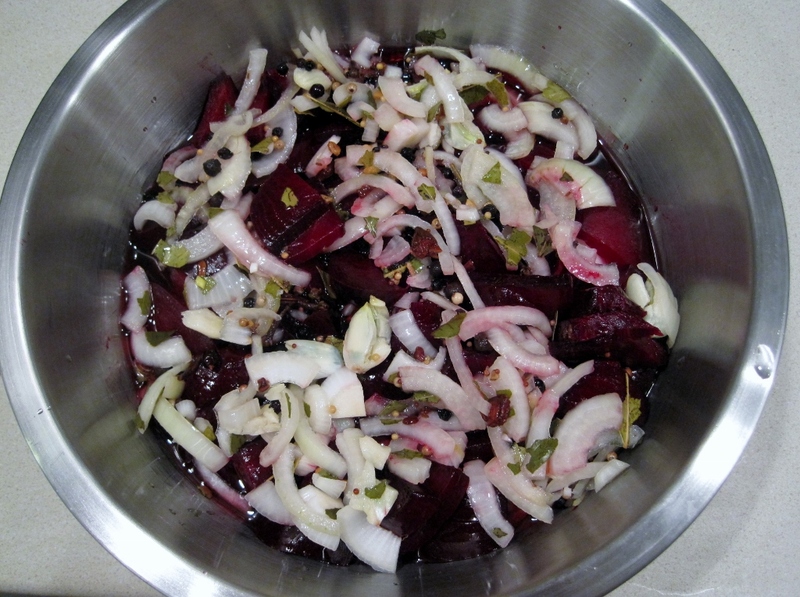 I based the recipe off of Emeril Lagasse’s but doubled it, reduced the sugar slightly, and added quite a lot more pickling spice than he suggested. 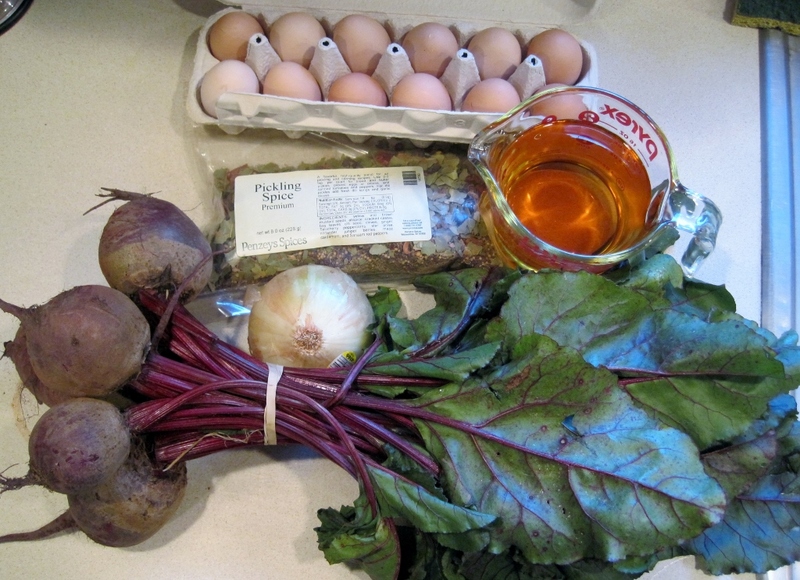 Cut off the beet greens (we had them for supper in a sausage bean soup) and scrub the beets clean. Wrap in tin foil and bake at 350º for an hour and a half. While that is happening, hard-boil the eggs however you like. 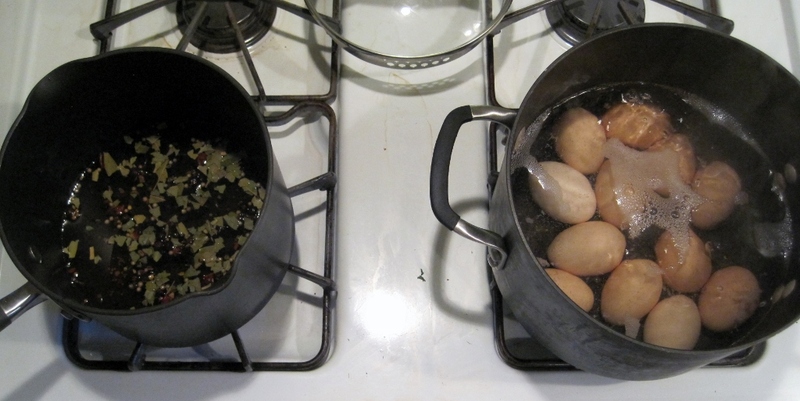 For me, I start with the eggs in a pot with cool water, then bring them to a boil over medium-high heat, boil for 6 minutes, then put into ice water until cool. Also during this time, put the vinegar, sugar, pickling spices, and peppercorns in a small pot and boil until the sugar is dissolved. Peel the eggs and put into a large mixing bowl. 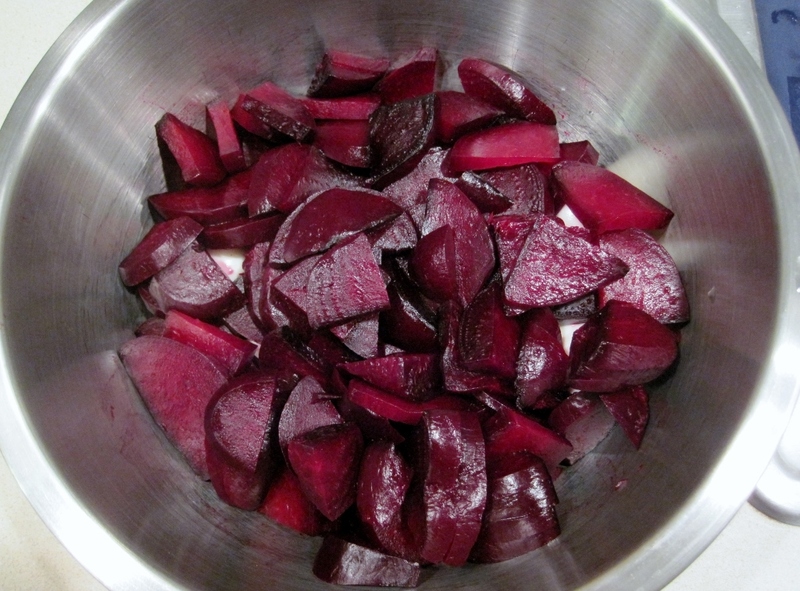 When the beets are done and cool, peel them as well. 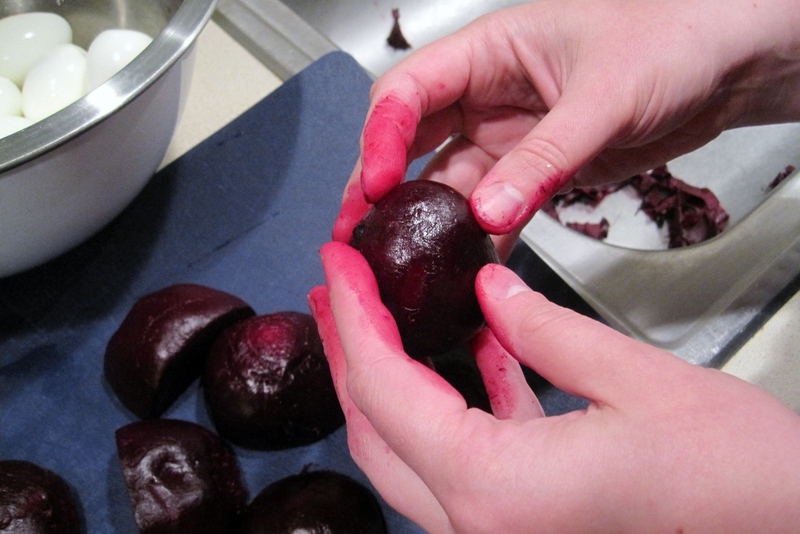 Peeling beets is always fun. 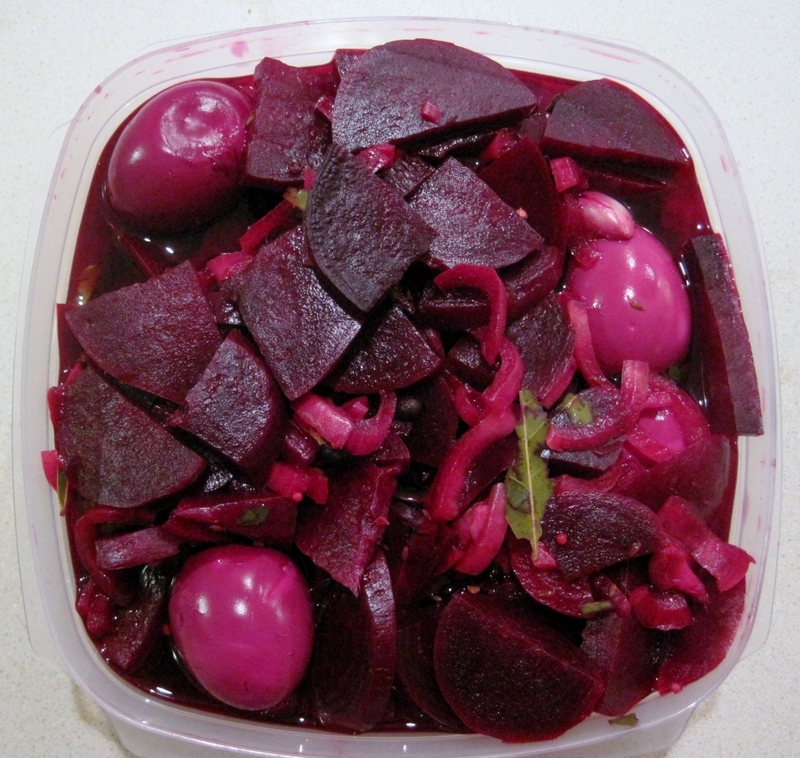 Slice the beets and put them in the bowl with the peeled eggs. Add the sliced onions. Pour the vinegar and spices over everything. Transfer to a sealable container, with the eggs arranged such that they are all submerged. Store overnight. The next day, gently move things around so any eggs that were pressed against the side of the container get more exposure to the liquid. The afternoon of that day, they are ready for eating. The longer you keep them in the liquid, the stronger they will taste. 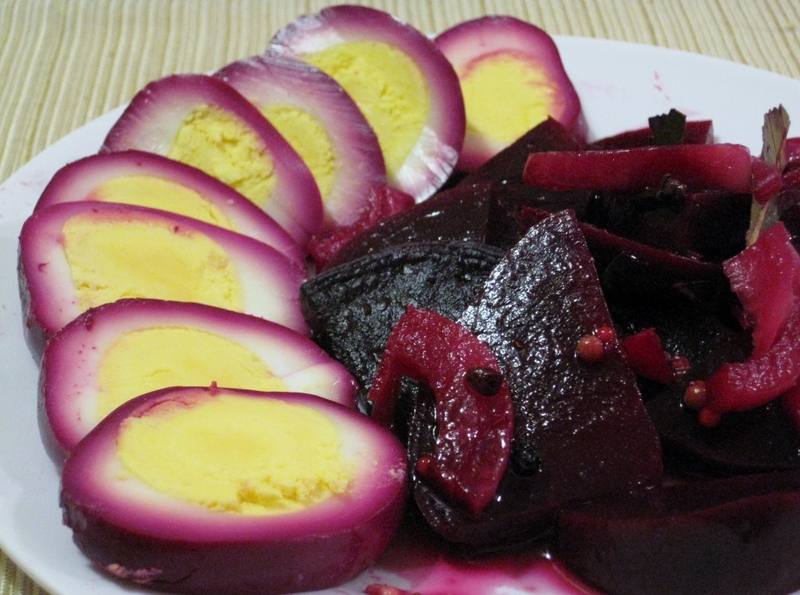 I imagine they should be eaten within a week, since the preservative pickling action doesn’t really penetrate to the center of the egg. 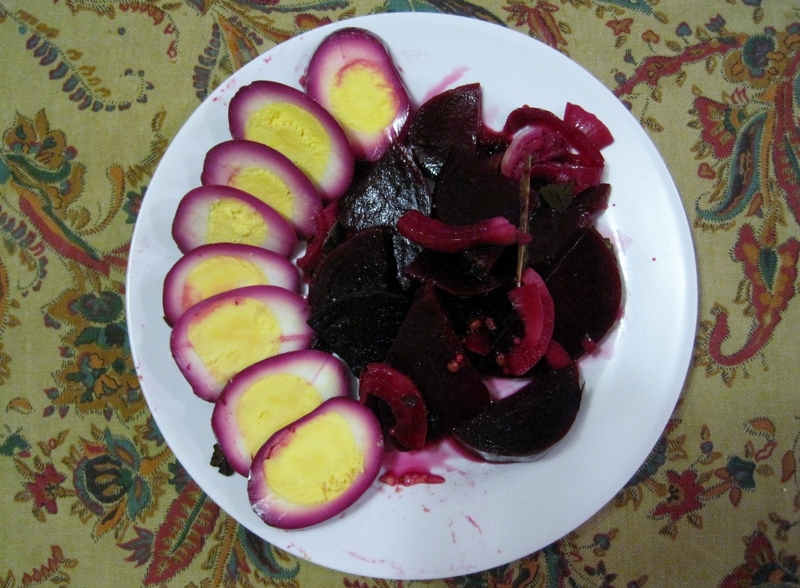 They look prettiest when sliced thinly and fanned on a plate with a side of beets and onions (which are also quite tasty). MY mouth is watering. So purple and rustic! Great post.